There are a number of public and private schools in the area. 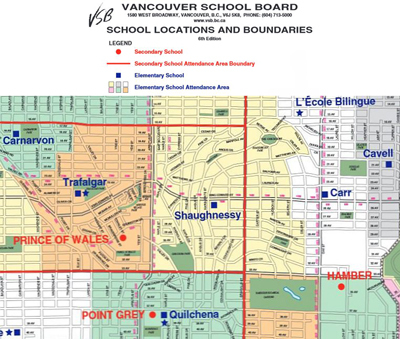 The secondary school attendance boundary cuts through the neighbourhood, so that the catchment area is either Eric Hamber Secondary School, in Oakridge, or Prince of Wales Secondary School, in Arbutus Ridge. Here is an overview of school locations and boundaries and you can find a list of schools below. To view the full map click here.